When Zoella aka Zoe Sugg brought out her own Zoella beauty range it didn't surprise me in the least that every other blogger were talking about this range too. If you haven't heard of Zoe then where have you been? Zoe or Zoella as she's known to the beauty community is a very successful blogger/vlogger with a huge following. I love watching her vlogs and seeing what makeup tips she's got to offer. I'm so thrilled for her, to have achieved such success and have her own beauty line is something we all dream of. The beauty line it's self is based around bath time, with a few makeup bags thrown it. It's not the biggest line of products but there's no doubt that Zoe will probably release more bits and pieces, maybe even makeup?! When I saw the promo pics and reviews of the products I instantly could tell Zoe had a huge in-put in the packaging style. Gold rose font and lots of dots just scream Zoe's style, and remind me of the style of her blog. It's very pretty and girly. I'm huge fan of bath bombs and was instantly drawn to the Fizz Bar which retails for just £5. The Fizz Bar is packaged to look like a chocolate bar with 8 chunky pieces inside. All you need is 1 or 2 cubes, to create plenty of fizz, in your bath water. Once the fizz bar has hit the water your left with a off-white, cloudy type water until the fizz disappears. Though the fizz isn't spectacular - like a lush bathbomb for example - the aroma that comes off of it is incredible. It's like a fruity floral note. The scent is really nice, I believe this is what all the products smell like. 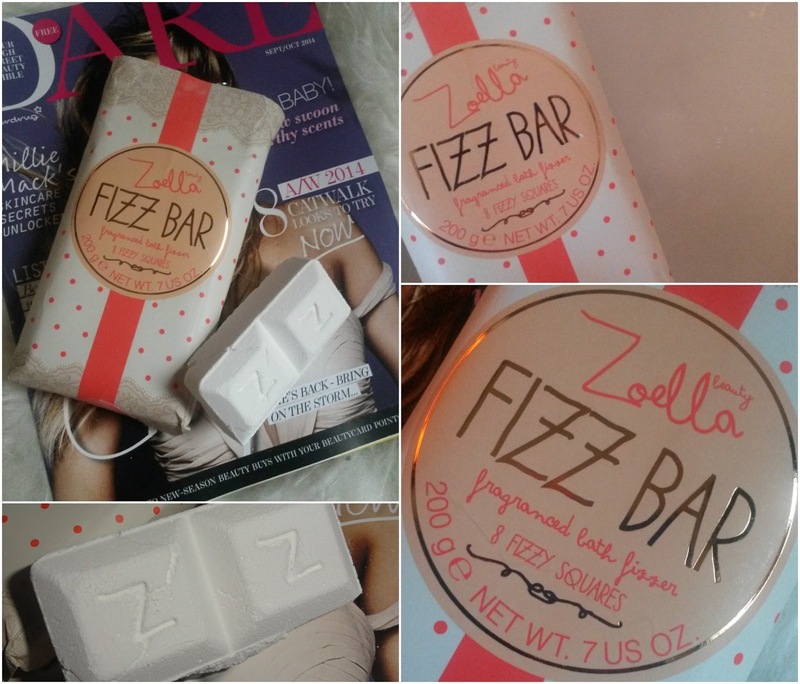 Zoe said in one of her vlogs the Fizz Bar was her favourite. 2 cosmetic bags - Zoella Eyes and Guinea pig. I really love the names she chose. The range is between £5.00 - £8.00 and available to buy from Superdrug or Feelunique (free international shipping on orders over £10.00 from Feelunique). What do you think of the range? Have you tried it? This sounds lovely - I only have a shower at mine so have to take baths at my boyfriends ha! Otherwise I'd definately buy this little beauty! I think the range looks really good and pretty, I really want to try it - nice post!! I really love Zoella, it's amazing that she has her own beauty range now!! Am I the only one who hoped the Fizz Bar would make bubbles? I guess I'm just a sucker for a bubble bath!